1 pound of house-smoked spicy chicken wings with carrots, celery, and blue cheese dressing on the side. In-house recipe beef meatballs served with marinara sauce and crostini. Classic garlic bread served fresh from the oven. Marinara on the side. Thin-cut fries, fresh garlic, Parmesan cheese, and truffle salt. Mixed greens, seasonal veggies, sunflower seeds, and dried figs. Served with choice of house-made blue cheese, ranch, honey mustard or balsamic vinaigrette. Romaine, house-made Caesar dressing with anchovy paste, egg, Parmesan, and croutons. Fresh basil, fresh mozzarella, Roma tomatoes, with olive oil and balsamic vinegar. Thinly sliced kale, cabbage, carrot, mint, green onions, peanuts, shaved brussel sprouts and spicy peanut sesame dressing. Spinach, red onion, bacon, feta cheese, dried cherries, and toasted pumpkin seeds with honey mustard dressing. Mixed greens, sliced egg, smoked salmon, chicken, bacon, tomatoes, avocado, and blue cheese crumbles. Your choice of blue cheese or ranch dressing. 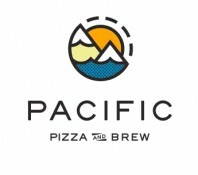 1/2 & 1/2 PIZZA Half n Half Pacific Recipe Pizza. The $1 is to make the Point of Sale Button work. All Half & Half pizzas are 1/2 the price of the full size! $1 cost on Half & Half Pizza. House-made meatballs, mozzarella cheese, and marinara sauce on a hoagie. With roasted red peppers, roasted poblano chiles, Provolone cheese, bacon, Roma tomatoes and green onion on a hoagie. Pepperoni, sausage, mushrooms, and green bell peppers. Marinara on the side. Mushrooms, fresh spinach, artichoke hearts, and roasted red onions. Marinara on the side. Smoked chicken mixed with Sweet Baby Rays's BBQ sauce, roasted red onions, and fresh sliced Jalape��os. Marinara on the side.